Swiss officer and military engineer Nicolas Doxat de Demoret — also referred to as Doxat de Moretz or Doxat von Morez — was beheaded on this date in 1738 for surrendering to a Turkish siege. Native — as his name suggests — of Demoret, Doxat was a career soldier who had served the Austrian empire since 1712. The generation of Doxat’s service saw Austria’s greatest expansion into the Balkans, with Turkey forced to cede to the empire most of present-day Serbia. Doxat emerged with some war wounds and a general’s epaulets. Unfortunately 18th century Vienna did not have access to the Internet articles informing it that this would represent its greatest expansion in the Balkans — for, in 1737, Austria jumped into a Russo-Turkish War with an eye to gobbling even more, and instead started suffering the defeats that would return its conquests to the Sublime Porte. General Doxat owned one of these defeats, the October 1737 surrender of the Serbian city of Niš to an Ottoman siege — yielded too readily, in the judgment of Austrian authorities. He had weeks of supplies remaining but with little water and no prospect of relief he judged the situation hopeless and accepted an arrangement that permitted the honorable withdrawal of his garrison. Despite the appeals of comrades in arms for clemency, the emperor confirmed the sentence of a war council, and Doxat was beheaded* in Belgrade on March 20, 1738. Barely a year later, that city too was in Turkish hands. 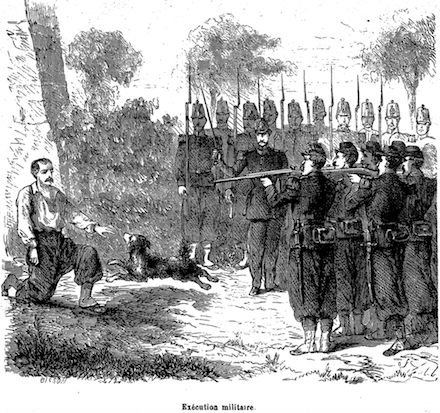 * The beheading, conducted in the botch-prone seated position, was botched — the first blow gouging the general’s shoulder and knocking him prone, where he was inelegantly finished off. The two soldiers (Corsicans) who committed a murder and robbery some time since at Neuilly, and were sentenced to death by court-martial, were shot yesterday morning, in presence of a large crowd, at the Polygone of Vincennes. One of them, [Jean-Baptiste] Agostini, was so exhausted that he had to be tied to a post to keep him from falling to the ground. The other, [Jean-Antoine] Ciosi, was more courageous, and, having addressed the shooting party to this effect, — “Dear comrades, on my conscience, I committed the crime for which I die, but I committed no robbery. I ask pardon of God, and of you. Farewell!” he himself gave the word to fire. The troops marched past the bodies as they lay on the ground. The interment took place in the burial ground of Vincennes, under the supervision of the chaplain of the fort. A longer French-language account of the crime and execution — including the necessity of a brain-splattering coup de grace to complete the sentence — can be found here. There’s some fuzziness with the date cited in different places but French press reports (for instance, from Le Figaro on January 22) unambiguously place it on Monday the 21st. Exit Elmer Sharkey and Henry Popp. The night of December 18, 1890, [i.e., after midnight on the 19th. People are just egregious with dates. -ed.] witnessed the double execution of Elmer Sharkey and Henry Popp. Elmer Sharkey, serial number 20,517, was the picture of physical manhood, young, handsome and accomplished; but his crime was the most diabolical one that ever disgraced the fair pages of Ohio’s history. About nine o’clock on the fatal night of December 18, Father Logan appeared at the Annex and baptized Sharkey in the Catholic faith. Shortly after this the two murderers were taken out into the reception room of the Annex, where they remained until after the reading of their death warrants. It was just a few minutes after eleven o’clock when Father Logan came into the Annex to comfort the condemned men. He informed them that there was no earthly hope; that the Governor absolutely refused to interfere, and that they should prepare for the worst. Sharkey and his doomed companion were then taken back into the Annex proper, where they bade good-bye to those who were left behind. A little later Warden Dyer came down the corridor and entered the reception room, to which the condemned men were again taken. Facing them the Warden said: “Boys, I have a painful duty to perform; but the law requires it. Henry,” to Popp “this is your death warrant.” Popp shook as with the ague, and stammered, “Yes sir.” He then arose to his feet and listened attentively to the reading of the warrant. The reading of Popp’s warrant finished, the Warden turned to Sharkey who was leaning against the steam heater and read his warrant. Sharkey stood with his hands in his pockets, seemingly indifferent. This over, Chaplain Sutton and Father Logan each offered up a fervent prayer, and then the Warden left the Annex to make further preparations for the executions that followed a few minutes later. As the hood was being adjusted he faltered and would have fallen backward in a faint, but was sustained by ready hands. Just as the noose was being drawn around his neck, he again lost control of himself, and started to fall; but the noose was slipped with a quick movement; the trap sprung, and down he went. As a result of his fainting he fell in a partially horizontal attitude, and the tightening of the rope produced a swinging motion of the body, thus breaking the force of the fall. The result was that the neck was not broken, and the poor, wretched matricide was left to die by strangulation. The sounds that floated out over the awe-hushed group as the dying man struggled for breath, is [sic] beyond description. The sickening sight and horrible sounds drove many of the spectators from the execution room. The drop fell at 12:05, and for several minutes the terrible struggle lasted, then the sounds from the throat, and convulsions of the body grew less frequent. At 12:34 the quivering heart ceased to beat, just twenty-nine minutes after the drop fell. All within that narrow enclosure breathed a sigh of relief when the attending physician finally pronounced him dead. His execution was one of the longest on record, and the longest in the history of Ohio. MOGADISHU, Oct. 25 (Xinhua) — Somalia’s Al Shabaab Islamist movement on Sunday executed two young men for alleged spying for the Somali government in the southern town of Marka. The radical group has been waging insurgency for two years against the Somali government and the African Union peacekeeping forces in the capital Mogadishu. “The men were executed because of apostasy and for spying for the apostate government. After three months of investigation and their confession to the crime they were executed in accordance with the Islamic law,” said Sheikh Sultan, an Al Shabaab official in Marka. Residents said that the young men were executed by firing squad of Al Shabaab fighters as crowds, mainly women and children, looked on the capital punishment. The hardline Islamist group of Al Shabaab controls much of southern and central Somalia and usually carries out amputations, executions, and floggings of criminals and opposition individuals in areas under their control, including parts of the Somali capital. The Islamist group, which is considered by the Somali government and the United States as a terrorist organization, declares a fight to establish an Islamic State in Somalia. 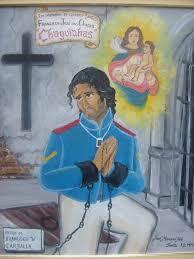 On this date in 1821, Brazil’s saint of freedom was martyred by the Portuguese. Francisco José das Chagas, fondly remembered as Corporal Chaguinha, led a mutiny in Santos of enlistees aggrieved by wages five years overdue, and the unequal treatment of Brazilian as compared to Portuguese soldiers. It was a fraught and contradictory political moment; the Portuguese royal family had spent the past decade-plus in the quasi-exile of their New World colony after fleeing Napoleon. In the process they had (even formally) elevated Brazil from a mere dependency to a coequal in the empire, and attempts to reverse this promotion once the royals returned to Portugal in early 1821 found little welcome in Brazil. Chaguinha was born to symbolize in his death his countrymen’s frustration. To great popular indignation a customary pardon was not extended to the man, who was instead publicly hanged in a notorious botch. After the rope broke repeatedly — and again a public clamor for clemency was refused — they strangled him slowly with a leather strap. A Catholic priest named Diogo Antônio Feijó, who in time would rise to become the regent of independent Brazil, would describe seeing “with my own eyes” seeing the still-surviving Chaguinha being murdered lying under the gallows after his last noose failed to support him. Brazil declared independence from Portugal one year later almost to the date (September 7, 1822), and won the war to clinch it. The martyred corporal was thereafter improved by veneration as a popular saint credited with miraculous intercessions for suitably patriotic Brazilians. – Danforth Hartson, convicted of murder, hanging, California. Hartson (aka Sailor Jim) claimed self-defense in a fight that followed his argument with “estimable citizen” John Burke, whom he knocked to the ground and then shot in the chest. Burke was able to make a full statement, naming Hartson as the murderer, before he died. Hartson’s last words came after he slipped through the noose and fell through the trap door. William Whaley, serial number 25,257, was executed in the Ohio Penitentiary Annex twelve minutes after the birth of a new day, June 22, 1894, for the brutal murder of Allen Wilson, a thrifty and hard working colored man. The crime was committed near Yellow Springs, Greene County, Ohio, on the night of June 6, 1893. Robbery was the motive for the crime, and a dray pin the instrument of destruction. He sneaked upon his victim in the dark, and literally beat his brains out. Whaley was a young man not over twenty-five years of age, and with perhaps one exception, was the most profane man that was ever incarcerated in the Ohio Penitentiary Annex. He refused all spiritual consolation, and cursed his executioners almost with his dying breath. He was a cowardly cur, and betrayed his cowardice while on the scaffold. Three times he sank to his knees as the noose was being adjusted. The attending Guards were compelled each time to assist him to his feet, and finally to hold him up by main strength until the rattle of the lever shot his body through the open trap. Being almost in a total state of collapse, the body instead of plunging straight through the opening, pitched forward, striking the side of the door, thus breaking the force of the fall. For this reason the neck was not broken, and death was produced by the slow and harrowing process of strangulation. The outraged law had been avenged, and a soul unprepared had been ushered into Eternity.